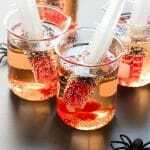 A simple mocktail Shirley Temple can be creeped up for Halloween with the addition of a few fun props! A great option to keep the party fun and alcohol-free. Ingredients may be multiplied times the number of Creepy Shirley Temples desired. Fill the beaker or glass with the soda. Fill a shot syringe with 1/2-3/4 ounces Grenadine. Add the cherries to the beaker or glass. Place the syringe in the beaker/glass for guests to 'inject' the grenadine into the Creepy Shirley Temple.